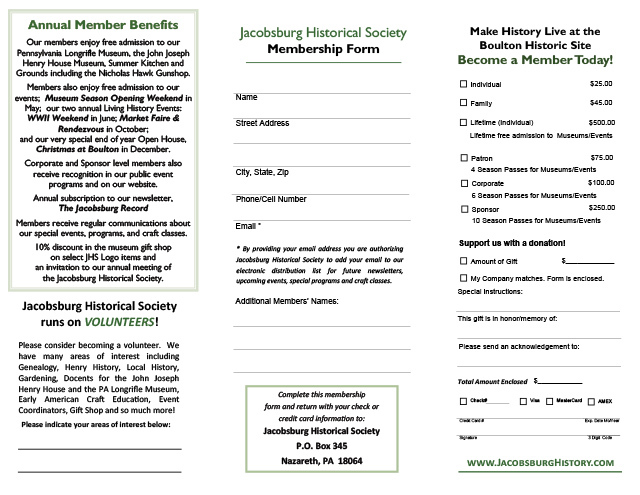 The Jacobsburg Historical Society (JHS) is a member supported nonprofit organization founded in 1972. Our mission is to preserve and present the art and industry of making early American firearms and the character of the individuals and community that created and sustained that enterprise. JHS makes its home at the Boulton Historic Site, part of the Jacobsburg National Historic District. The Pennsylvania Longrifle Museum is located in the old Henry Family Homestead at Boulton, 403 Henry Road in Nazareth. The John Joseph Henry House, Summer Kitchen, and Grounds, including the Early American Craft Center and Nicholas Hawk Gun Shop, are located at 402 Henry Road. Please click here or on the image below to open our membership form. Please print the file and send the completed application with your payment to the address noted on the application. Just below you may complete your membership online. Please select the Membership Type, add Additional Members Names, and then click on the Buy Now button.